The issues of eat local and measuring your "food miles" when doing your weekly shopping are important -- and complex -- issues. While many assume that the further a food travels from field to fork means that it consumes more energy, it is actually a much more complicated equation that goes into figuring out a food's energy consumption. Would you be surprised to learn that the means of production and the method of travel have a far greater impact on a product's energy consumption and carbon emissions then does the distance it travels to market? New Zealand venison is a low carbon meat, produced in a natural, sustainable manner. 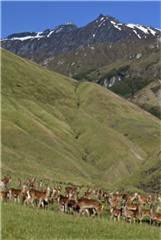 New Zealand deer farmers have always aspired to sustainable land management via industry-wide programs to avoid potential negative impacts on the environment. 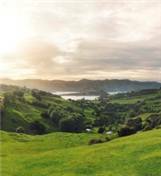 New Zealand is blessed with ample rain and vast open pastures. Farming is a natural use for the landscape, and New Zealanders have been growing livestock and crops for 150 years, with little damage to the soil or water. In New Zealand, the natural fertility of the soils, the benign climate, and the extensive use of nitrogen fixing clovers in pastures provides much of the goodness necessary to grow pasture to feed farmed deer. New Zealand farmers use nitrogen fertilizers to improve pasture fertility, control non-native weeds, and ensure good animal health. Animal welfare is key to achieving the highest quality products (including Cervena venison), as well as sustainable land management. Deer are never housed in New Zealand, they are never kept in feedlots or confined spaces. They are never fed corn-based diets, which drastically increases the "energy points" of any meat. Most deer are farmed in mountainous regions with vast fields stretching over hundreds of acres. They live on grass and hay. New Zealand deer farmers believe they have a duty to avoid, remedy or mitigate any adverse effects that their activities may have on the environment. When producing food, farming impacts the environment in several ways such as soil erosion, water use and degraded water quality. The New Zealand deer farming industry has an active program in place to ameliorate these negative impacts by educating farmers and recognizing success in minimizing environmental impact. Venison processing companies and their farmer suppliers work in partnership with international customers to produce quality products to high environmental standards. Cervena marketing companies in New Zealand are working towards on-farm assurance programs which monitor animal health and welfare, and the environmental impact of farming operations. Many people would question the sustainability of transporting food from New Zealand, citing the energy used in shipping. The fact is that shipping accounts for a very small percentage of the total energy used in delivering food to consumers. Virtually all New Zealand venison is shipped by sea freight and sea freight is the most efficient means of transporting goods around the world. Numerous studies have demonstrated that it is more energy efficient to grow food in New Zealand and transport it to market by containerized sea freight then it is to grow food in the market in a less efficient manner. For example, a study examining lamb-meat production in New Zealand and the United Kingdom* found that producing lamb in New Zealand and shipping to the UK produced one quarter of the carbon dioxide of producing lamb in normal intensive conditions in the UK. The shipping of New Zealand lamb to the UK contributed only 18% of the total CO2 emissions. The main contributing factors to New Zealand’s lower numbers are the fact that animals are not housed in New Zealand, they are fed a 100% grass diet and farmers use a smaller amount of fertilizer in New Zealand. *Food Miles – Comparative Energy/Emissions Performance of New Zealand’s Agriculture Industry, Saunders et al 2006.